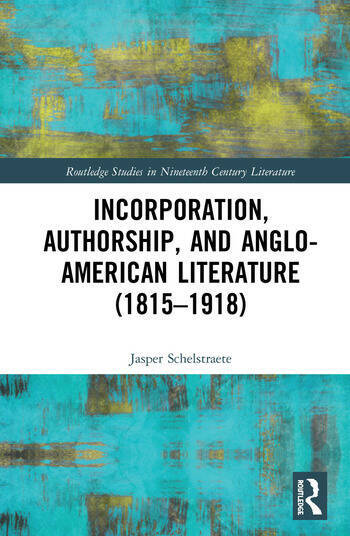 Incorporation, Authorship, and Anglo-American Literature (1815–1918) is concerned with the new ways in which nineteenth-century authors came to imagine nationhood in response to the emergent global market. It investigates how authors negotiated a largely unregulated global economic space, both imaginatively—in their representations of it—and pragmatically, through author-publisher agreements to circumvent the lack of transnational copyright or through market-driven self-censorship for different audiences. Until now, scholarship has struggled to find a single dynamic from which to consider the Anglo-American transatlantic cultural field, and transnational fields more generally. This volume offers that single dynamic through an innovative and interdisciplinary approach that brings together the research areas of literary and transnational studies with economic history. It shows how the positional national identities constructed by nineteenth-century texts were informed by economic self-interest in the emergent global marketplace. Through a series of case studies the book analyses how contemporary economic innovations determined nineteenth-century concepts of national and cultural self-identification. Presented within four main body chapters, each considers two case studies of nineteenth-century authors that are in productive contrast, including pairings between Herman Melville and Washington Irving, E.D.E.N. Southworth and Anthony Trollope, Charles Dickens and Harriet Beecher Stowe, and finally Thomas Hardy and Joseph Conrad. Jasper Schelstraete is an FWO postdoctoral researcher at Ghent University. He defended his doctoral dissertation, "The Atlantic Between Them: Dickens, Melville, and Nationality in the Transatlantic Market" at Ghent University in August 2014. He has held a Belgian American Educational Foundation Postdoctoral Fellowship at Harvard University, and was awarded a Government of Ireland Postdoctoral Fellowship. His work has been published in English: Journal of the English Association, Journal of Victorian Culture, Victorian Periodicals Review, and Dickens Quarterly.